We were all very close as a family, especially growing up. I have extremely fond memories of my youth. Nothing fancy, we lived on a council estate but it never bothered me once, right up to getting married. Our home was a lovely one full of love and always someone visiting. Christmases were special. Not extravagant just special and all about family. Pauline and I generally received the same gifts but would be playing with them weeks before christmas. Bernadette bought us both a massive selection box each but by the time she came to wrap them they were empty. She was fuming. I was only about 3 when pauline would find the presents and tell me i could play with them. I remember we were in a trance with our christmas dolls when pauline scarpered - mum came in and shouted me all the way to bed - pauline was hiding behind the door and got away with it. Mum found our sindy dolls covered in jam and paulines typewriter had a letter in it saying "my name is pauline kearns" - we were like the terrible twins! i remember one year i wanted to open my present christmas eve but pauline didnt so she hid behind the sofa while i unwrapped mine. I was very careful not to let Pauline know what it was, just saying how amazing it was - then mum said "give it to your dad to wind up" completely spoiling the surprise for Pauline - we had both got beautiful gold watches. Anne and Bernardette seemed to bond together and me and Pauline bonded also. 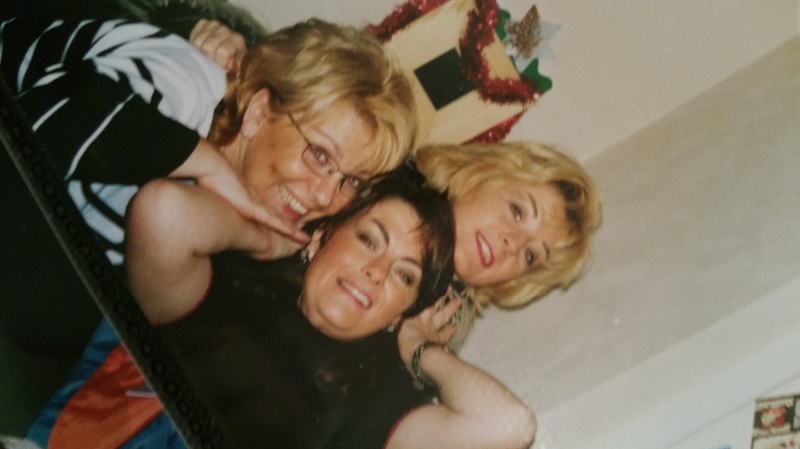 We were very close as teenagers, worked at bars in Bradford centre and partied together which pleased my mum as she could relax and sleep when we were out until early hours of the morning. We would roll in, freezing, wearing next to nothing and mum would have our beds warm for us with electric blankets. I was the wild one and would force pauline into situations that she felt uncomfortable with. We didnt earn much money then so there was no way i would ever pay for a taxie home. I am sure you can all relate to this but part of the evening was finding a lift . It was usually 2 policemen who would be patrolling outside the club. They would wait and give us a lift home, telling the sergeant on his walkie talkie or whatever it was then lol we have just rescued 2 girls and they need escorting to safety. Of course there was no funny business, i was such a prude but we gave them a sneaky snog when we got home. This one time when we came out of "back stage" they were no where to be found but 2 lovely guys who we had been talking to offered us a lift. Pauline said "no Way Jane" "come on Pauline im skint" - next thing we knew we were rocketing up Manchester road on the wrong side of the road at 100mph. The driver had turned mental ffs !!! Pauline was crying in the front while i was lauging in the back but then realised how bad the situation was and demanded he let us out. By this time we were in peel park where someone had been murdered 2 days before - Pauline jumped out crying and i coaxed her back in - come on guys it was 3 in the morning and freezing!!. They took us home safely thank God. Some of the stuff we did was hillarious !! Fast forwarding quite a while. After the death of Bernardette, Mum and Dad - Anne, Pauline, Bernard and myself were quite close. Although we had our own busy lives, we were always there for eachother and Anne was like the mother figure, always sorting out our problems etc. A few years ago Anne and myself had a fall out over a misunderstanding but it escalated and we ended up not speaking for quite a while. Anne was really busy with her boys who had formed a band "Whitelight Parade" and were in London quite alot and i was busy with work and my family,so we drifted apart. A few years ago i received a lovely christmas card from Anne with a letter inside which i carry with me always. It means so much to me and I feel so lucky to have it. A couple of months ago I got some meat lodged in my throat, it was really bad and i thought i was going to die (sounds dramatic but it was really bad). My life flashed before me and i thought about you, I had deep regret that we have not kept in touch more and I did not want to die without letting you know how much i love you and how much you mean to me. So i want to let you know this christmas that I love you jane xxxxx"
It was summer 2011 - i was out at work, driving to selby to do a nurse meeting when the phone rang - it was Anne. She told me that she had been diagnosed with cancer in her kidney. it floored me completely, i was not expecting it at all. I reassured her i would be there for her night and day no matter what. "Please help me, im scared" she said. I told her i was going over to see her straight away. Her family was there and Pauline. We chatted about the diagnosis etc. Now, i am not going to go into too much detail about Anne in respect for her family but i will talk about some of my feelings as things progressed with her. It was very tradgic - both pauline and myself are finding it extremely difficult to come to terms with the night she passed when we were all with her and the period of time before when she was deteriorating was heartbreaking to watch. The conversations we had ripped my heart out completely. Before she became housebound she would come to visit me when i was ill and i would her quite alot. We saw more of eachother than ever before. I came to terms with Bernardette, Mum and Dad but for some reason loosing Anne is extremely hard. Pauline and I are like two little kids really, clinging onto eachother. I cant fathom out where she is. One second she was here and the next gone. As mentioned in page 1 - it was september and i had gone back to work after having the tired spell on the sofa. It wasnt just tired, it was soooo tired i couldnt lift my head up. Anyway it was a lovely day as the September days seem to be. Clear sky and very warm. I remember being sat in the study doing my emails before heading out to meetings. I had planned to visit Anne as usual after my meetings. I heard an almighty screech of breaks outside the window (the main village street was outside the front of the house) A small child was screaming. I ran out to see a black cat had been hit by a car right outside the window and killed. After visiting Anne i came home and returned to the study to open my mail. That is when i was called back following my mammogram. It didnt register really but i immeadiatly thought should i just go and not tell anyone because i know how much David worries about stuff. However, i decided to tell him and Dolly (his Mum who was staying with us at the time). I played it down but could see the worry in his face. My appointment was the next day.